Natural food colors are used to enhance the color and taste of processed or cooked food. It consists of natural extracts with zero toxic level which are environment friendly in nature. Natural food colors improve the appearance of food. Increase in demand for natural food colors is likely to decline the demand of synthetic food colors which are hazardous for the environment and for the health as well. Natural food colors are used in food, beverages and drug industries in order to restore color of the product for good appearance. 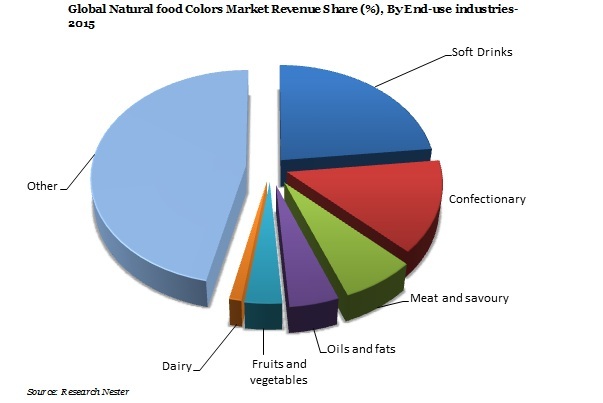 The global natural food colors market was valued at USD 1. 3 Billion in 2016, and is expected to register a CAGR of 7.8% over the forecast period i.e. 2016-2023. Further the market is estimated to garner USD 2.1 Billion by 2023 on account of rising demand of natural food color in food industries and rapid expansion of food and beverages sector across the globe. Alternatively, Asia-Pacific market of natural food colors is estimated to be the fastest growing market across the globe. The market of Asia-Pacific is mainly increased by the rapid expansion of food industries owing to urbanization. Rising population across the region and their growing concern towards health and fitness are swelling the demand for natural food colors. Furthermore, the market revenue is anticipated to swell by 7.4% to reach USD 310.2 Million by the end of 2016. Wide-varieties and application of natural food colors in food industry is making it the most required substance for the enhancement of food products. Rising population across the globe sequentially increased the demand for healthy food with less synthetic ingredients. Rising concern towards health and nature derived food ingredients are likely to pave the market of natural food colors. Government banned trading of synthetic colors in several regions such as Europe and Japan has resulted in restricted manufacturing of synthetic colors. This factor intensified the demand for natural food colors in various end-use industries. Several initiatives and promotions are carried out by various authorities in order to grow awareness towards eco-friendly and healthy natural food colors is expected to exhibit a positive impact on the market of natural food colors in near future. Increasing awareness about the harmful effects of synthetic colors and the chemical used in manufacturing of such colors are substantially raising the demand for natural food colors in numerous end-use industries. Strict government regulations on the trading and manufacturing of synthetic color have led the food and beverages industry to adopt the new and advanced formula of natural food colors. Moreover, encouragement from various food security authorities for using natural food colors in products such as infant toys, textile printing and handmade paper etc. is swelling the demand for natural food colors. The market is majorly driven on the back of factors such as growing need for natural extracts additive for processed food, rising health consciousness among the population in urban regions and growing demand for natural colors on account of cost-effectiveness and health benefits. Furthermore, technological advancements in food industries to procure sustainable solutions for the enhancement of packaged food are fostering the growth of natural food colors market. Emergence of food industries owing to rising population and their daily needs of food and growing number of food products are further likely to bolster the demand for natural food colors across the globe over the forecast period i.e. 2016-2023. Although, lack of awareness in undeveloped nations, slow adoption of natural food colors in developing nations and high cost extraction of natural ingredients on account of biotech processes are some of the factors hampering the growth of natural food color market in near future. Additionally, instability of natural food colors and high manufacturing cost are the main challenger for the market of natural food colors in near future. However, continuous research and development for developing effective and low cost natural food colors is increasing by various government and private organizations to overcome the factors which are restraining the growth of natural food colors market.